rec. 1-4 November 2010, 23-24 May 2011, 23-25 February 2012, no location information provided. Josef Suk was an accomplished musician and the co-founder along with fellow students of the Prague Conservatory, of what was to become the famous Bohemian Quartet. He was play as part of that quartet for most of the rest of his life. It is therefore understandable that he would go on to compose his own works for the medium. Apart from the very fine recording of the complete chamber music by the Suk Quartet and others on Supraphon (11 1874-2 - review of earlier issue) this music has not fared too well when it comes to recordings. I find this hard to understand, especially when given performances as convincing as those on this CPO set. 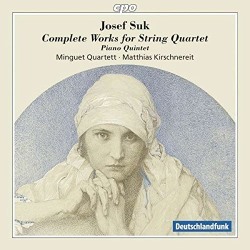 This 2 CD issue opens with, whilst not his first attempt at a string quartet, Suk’s first published quartet. It dates from 1896. This Quartet op. 11 shows an indebtedness to his teacher and future father-in-law, Antonín Dvořák. This influence is especially prevalent in the first movement Allegro moderato, however, there is little of this to be heard in the second movement Tempo di Marcia. If the voice of the elder composer is to be heard in the beautiful slow third movement Adagio ma non troppo, it is more in the intimate structure of the musical language rather than in the themes. In the final Allegro giocoso Suk has stepped away from Dvořák in what can be seen as a precursor to Czech modernism. The String Quartet op. 31 is in complete contrast to the op. 11. The longest of Suk’s compositions for string quartet, it was composed in 1911, and shows that the composer had moved away from Dvořák. I find this piece to be the boldest and most striking of all Suk's works for string quartet. Each of the first three movements are adagios. In CPO's case the movements are banded as individual tracks unlike the Supraphon which had the four movements in a single span. The work opens with quite an intense Adagio ma non troppo with this increasing through the movements. Things culminate in the final Allegretto where it is as if the composer is letting of a bit of steam. This is my favourite of the two quartets. It may be more modernist than the first. This is the Suk of the Asrael Symphony but the Czech character of the music remains strong and melodic. Of the other shorter works for string quartet presented here the Meditace na Starocesky Choral “Svatý Václave” op. 35a, or Meditation on the St Wenceslas Chorale, of 1914, is probably the best known. It also appears in the composer's War Triptych. Also included are the two surviving movements, the Quartet Movement in B flat Major and the Barkarole in D minor, from Suk’s very first attempt at writing a quartet, the String Quartet (0) in D minor of 1888. These shorter pieces are no mere makeweights. They mark the composer’s progress as a quartet writer. The set is completed by the Piano Quintet op. 8 in G minor, which was composed in 1893. Although the work met with some praise, Suk was not altogether happy with the work, revising it some 22 years later. It announces itself strongly with an opening Allegro energico, although it is the slow Adagio (Religioso) with its almost meditative structure which for me forms the basis on which the other three movements depend. This is an excellent work, one in which the composer's early developmental style mingles well with the more mature of his revisions. The Minguet Quartet are joined by the excellent Matthias Kirschnereit who is on sparkling form and seems to fit into the ensemble effortlessly. As to the Minguet Quartett they have long been a favourite of mine. This is not just because of their championing of those composers on the edge of obscurity, such as Robert Fuchs, Othmar Schoeck and Heinrich von Herzogenberg (CPO 777 082-2), but also for their playing. There is a very strong sense of ensemble and what’s more, there is a feeling that they relish and enjoy what they play, as do I. This present recording is no different, it is hardly mainstream repertoire, yet it is lavished with a performance that will only bring me continued enjoyment. First rate.